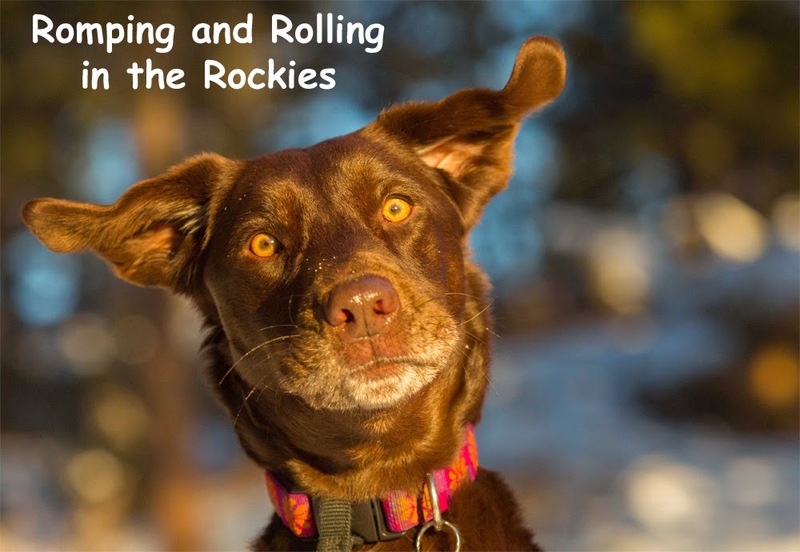 Romping and Rolling in the Rockies: Wildlife Monday - Mountain Lions! 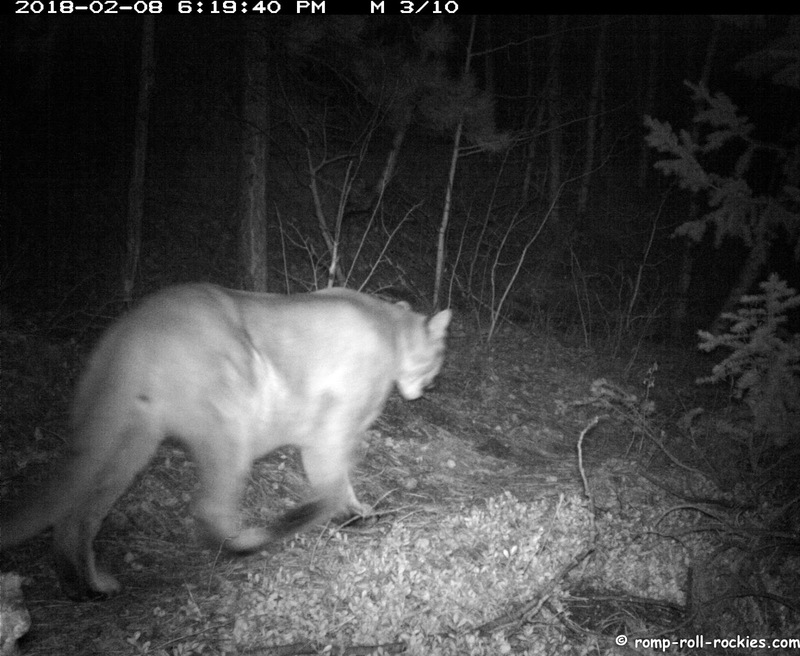 Wildlife Monday - Mountain Lions! Last week, I decided to grind my very wide fat bike tires through unpacked snow to check some trail cameras. The amount of snow on my route varied from 8" to zero, depending on the sun exposure. 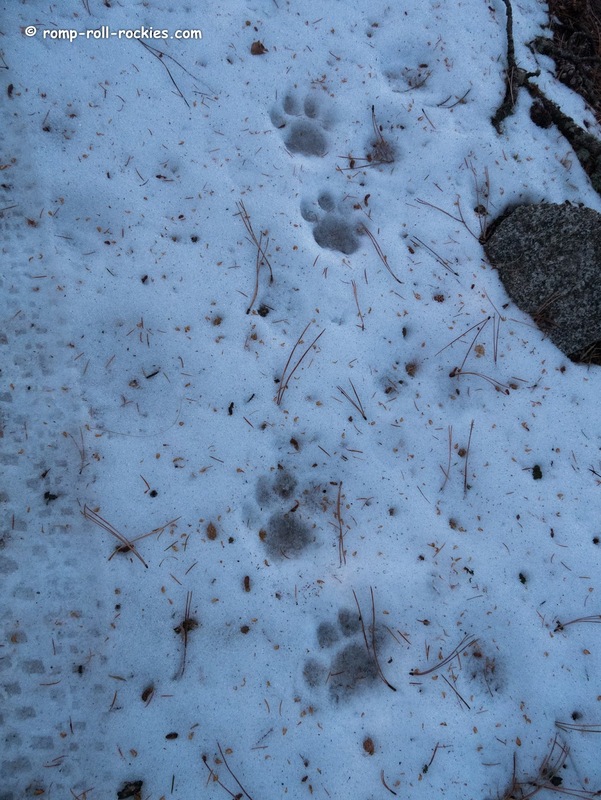 As I started my ride, big and wide mountain lion tracks joined my route to lead me to my cameras. 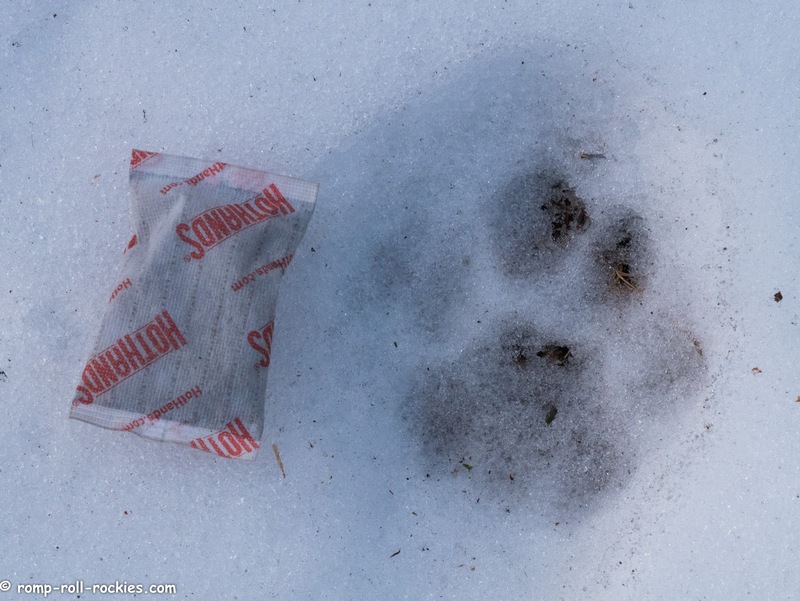 I had no doubt that they were mountain lion tracks. They were big, although far from the biggest that I've ever seen. My chemical handwarmer is 3.25" long and is in the next photo for scale. As I followed the lion, I got to see all the small deviations between his route and the path covered by my cameras. I dropped my bike and carried my GPS as I recorded his route to examine later and possibly adjust a camera location. He evaded one camera by climbing up a hillside. Then, he passed by another camera to let us see him. Somehow, after passing my trail camera that takes still photos, he wiggled his route to completely miss a nearby video camera. Then, we came into an open area, and there was no snow to record tracks. However, a quick check of a camera showed that the lion had come through there. I'm learning that this open area is very special to the mountain lions. 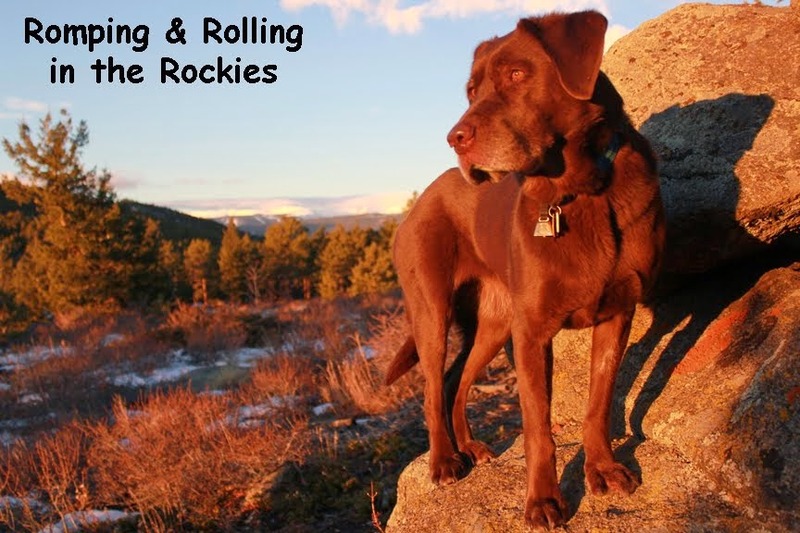 It is one of the few areas where they feel comfortable enough to be out in daylight on a regular basis. I sure hope that humans don't discover it! The lion who I'd been following was only the most recent one - there had been an unprecedented number of lions wandering around our neck of the woods over the past few weeks. I think that the mild winter might be the reason why they are staying at our relatively high elevation this winter. The "mild" temperatures came to a halt for the weekend. I watched the temperature plummet by 25°F in a very short time on Friday night. Then, it started to snow. I really wanted to check another camera for this post so I made a quick foray to it, barely keeping myself from freezing while standing still to deal with the cam. However, it was worth it - I found even more footage of lions! I'm glad that I endured the agony to my poor Raynaud's addled fingers. I made a video (on Youtube) of the activities of the mountain lions over the past couple of weeks, including one lion who went up on his hind limbs to sniff high in a tree! Almost all the lions looked very healthy and well fed. 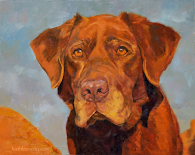 I hope that you've enjoyed my Wildlife Monday post! They are such sleek and beautiful cats. Just knowing they are out there must be a thrill. WOW! I know they are out there, haven't been fortunate enough to see one in 21 years up here. I am grateful for your trail cams and videos. Thank you! Oh my goodness I did so enjoy them. You live in a beautiful area. 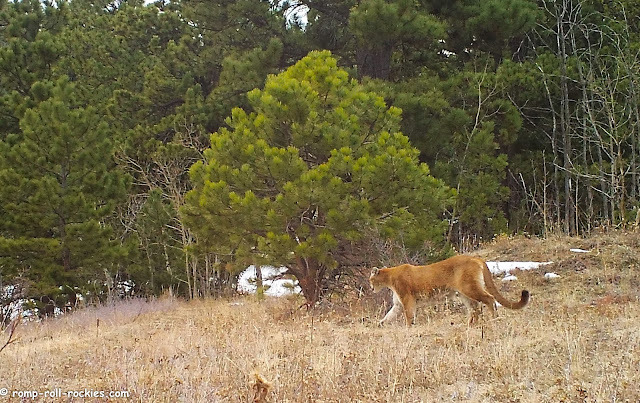 Pardon mom's novice question but do you ever worry about running into the Mountain Lions in person when on the trail? She doesn't even like running into me in the dark in the house at night. She is such a frady cat. I don't worry when I am generally out and about in the forest. But, as you will be learning from an upcoming post, I found an elk yesterday that a mountain lion had killed. I got the away from the carcass (that the lion might defend), phoned a friend with the means to protect us, and we went back to set up two trail cams pointed at the carcass. Although the carcass was in a scary spot with rock outcroppings blocking our views in every direction, the lion stayed away while we set up the cams. Now, I'll leave the cams alone for a long time so that I don't risk meeting the lion. 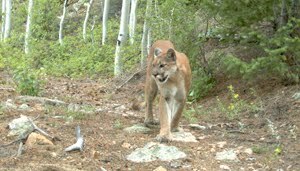 The one time that I came upon a mountain lion when he was just walking along, my dog (Angel K) treed him. That was unbelievable. She saw him and bolted toward him. He turned and climbed high in a big tree. I grabbed K and we left the scene very fast! I was scared that time. What a great shot of the lion traversing the meadow! One of my friends who lives in Nathrop has seen them chasing deer in her neighborhood. We are imagining the "quiet" that you hear as you are tracking these tracks! We can even hear your world, as your feet crunch the snow. They are truly beautiful animals. I do hope you are careful up there. We always love seeing the big cats! My what big feet! Pretty cool to see actual lions in real life. I hope the humans leave them alone. Moose in Winter - Watch out for the Thin Ice! Wordless Wednesday - Winter Finally! Thankful for Morning Sunshine, Finally!